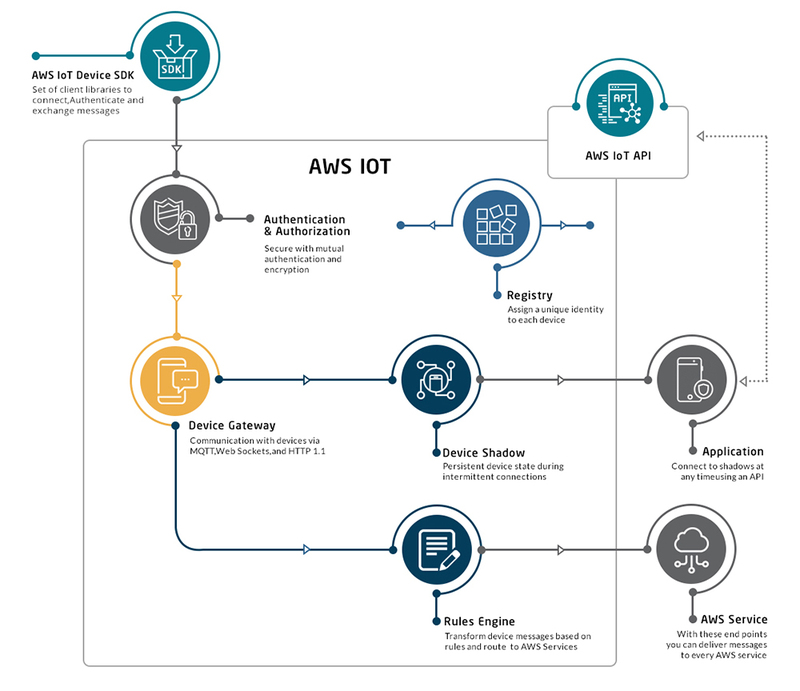 Build Enterprise Grade Solutions with AWS IoT Services . As an Amazon Web Services (AWS) Consulting Partner, Solution Analysts proudly leverages the power of the Amazon Cloud across a diverse array of client engagements including full stack mobile app developments, connected hardware experiences, and voice skills. The Amazon Cloud considerably improves a product’s speed-to-value, which is crucial in today’s fast-paced digital world. While configuring traditional enterprise infrastructure can take weeks, the Amazon Cloud allows Solution Analysts to create a project in seconds, allowing developers to invest more time and energy in the product. AWS’ Platform-as-a-Service (PaaS) features, such as Lambda and Elastic Beanstalk, provide the speed and scalability Solution Analysts needs to tackle whatever comes next. It gives a unique identity to all devices irrespective of its type or connection. Registry also supports metadata and lets you store metadata for free. It lets devices communicate with AWS IoT exchanging messages using one-to-one and one-to-many communications. It is the virtual version of device that stores the latest state of device so that other devices and apps can interact with that device. AWS IoT makes sure that the data between the devices and AWS IoT is never exchanged without the proven identity. It helps in building IoT apps that collects, processes, analyzes and acts on data generated by connected devices. We specialize exclusively in AWS architectural design, demonstrated through hundreds of successful implementations and award-winning projects. Our goal is to enable organizations to get onto, and using, AWS fast and to maintain their agility long-term by managing their own systems. We provide remote cloud-enablement and IT modernization services to organizations around the world. Conduct an architecture assessment to understand business requirements, current/planned technical layout, design the desired state architecture, and create a roadmap. Post assessment, Our executes on the design plans and create a scalable, secure IoT architecture. Finally, our goal is to empower customers with the knowledge and technology to be able to manage and extend the solution on their own. Our Subject expert will contact you to clarify your project requirements. We involve subject matter experts during this stage to elaborate and propose the optimal technical and business solution. We continuously develop innovative software that work in tandem with modern IIOT equipment to provide your business with the data to grow. We strive for excellence in everything we do. Our Solutions are built based on many years of experience in manufacturing environments. We will be a partner for your business and a valuable member of your team. To get the most from our Solutions, we work closely with your key employees. Return on Investment is a criterion that we are mindful of when designing and implementing our solutions. We will not sell solutions that do not add to your bottom line.